Cool to see another entry, Hotshot. 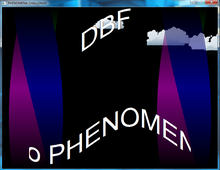 Twisters, ufo, clouds and DBF logo moving smooth. Good work. However, I see in the screenshot that in the bottom there is also some text which is not displayed on my system. In addition, I see that the download folder contains music - this is not played unfortunately. Is a library missing for the music??? Hmm ... thanks for the answer. Your intro looks like the following (refer to attached screenshot). So, the bottom text is missing. I can see the music file on my harddisc in the SFX folder - but it is not played on my machine. Strange - what music playback routine do you use, fmod, bass.dll Maybe its missing the library ? Working well here on Win 7. Everything's visible too. Nice music, cool Ufo! Benny?...Is your window 7 or XP? Cool demo Hotshot, great tune and I love the little UFO! Music didn't loop but stopped halfway through the scroller, not sure if that was intended? Well done Hotshot! My music loops, apparently, because I was lucky and didn't specify the NO_LOOP flag! nice little intro everything is working except the music which isn't looping. if you want me to insert a loop I'll do it for you, but I think the deadline has just arrived :-/ very oldscoolish demo ..I enjoyed it! Very good Hotshot, I like the music too! I also like the 3D effect on the twisty colour bars, and the clouds look old-school too. The UFO itself moves a bit too fast for me to see it properly, but it does sweep quite menacingly back and forth. I wonder how UFOs defy gravity without rocket engines or propellors.